This detailed book showcases recent advances in computational design of multi-target drug candidates involving various ligand and structure-based strategies. 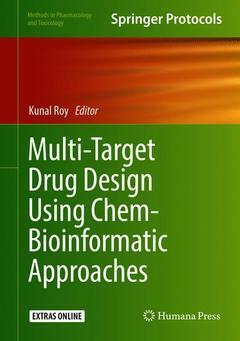 Different chem-bioinformatic modeling strategies that can be applied for design of multi-target drugs as well as important databases and web servers in connection with multi-target drug design are also featured in this collection. Written for the Methods in Pharmacology and Toxicology series, chapters include the kind of key implementation advice that will aid researchers greatly in their laboratory pursuits. Authoritative and practical, Multi-Target Drug Design Using Chem-Bioinformatic Approaches seeks to aid all scientists working in the field of drug discovery research. Cindy Juliet Cristancho Ortiz, Matheus de Freitas Silva, Vanessa Silva Gontijo, Flávia Pereira Dias Viegas, Kris Simone Tranches Dias, and Claudio Viegas Jr.
Sinoy Sugunan and Rajanikant G.K.
Dr. Kunal Roy is a Professor in the Department of Pharmaceutical Technology, Jadavpur University, Kolkata, India. He has been a recipient of Commonwealth Academic Staff Fellowship (University of Manchester, 2007) and Marie Curie International Incoming Fellowship (University of Manchester, 2013). The field of his research interest is QSAR and Molecular Modeling with application in Drug Design and Ecotoxicological Modeling. Dr. Roy has published more than 280 research articles in refereed journals (current SCOPUS h index 37). He has also coauthored two QSAR-related books, edited three QSAR books and published ten book chapters. Dr. Roy serves in different capacities in the Editorial Boards of several International Journals.